Darren "DT8" Tate is back. This double A-side EP, taken from Darren's forthcoming "Horizons 02" artist album shows that Darren is still at the top of the game when it comes to making timeless club anthems. Already being dubbed as one of the most moving and uplifting tracks of 2009, "When The Morning Comes" is a beautifully well balanced and executed musical masterpiece. Featuring Darren's trademark of writing spine tingling emotional music coupled with infectious melodies and cutting edge production it's hard not be be drawn in and get lost in the music. This is a record you'll most certainly want to have as a soundtrack for the summer! Already picking up major support including world No.1 Armin van Buuren (ASOT) this one is hot hot hot and not to be missed! 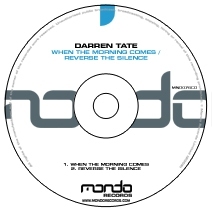 Moving us into a more dirty and techy arena 'Reverse The Silence' showcases Darren's clinical production skills and gift for creating tracks with endless energy from start to finish which why it's no surprise this is already a firm favourite of BBC Radio One's Judge Jules who's kicked started the campaign in fine style. 'Reverse The Silence' takes no prisoners and delivers an immense sound when dropped to an unsuspecting crowd, and with an absolute bomb of a breakdown which genuinely sends shivers through the spine this track will blow the roof off clubs the world over this summer.